L 32″ (81 cm) W 52″ (132 cm). Food: Very good swimmer and diver, feeds mainly on fish. 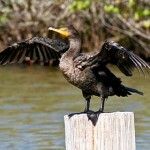 Habitat: Migrating birds use deeper marshes, lakes, and reservoirs. Breeding occurs on islands, trees, or cliffs near water, and within about 10 miles of an adequate fish supply. Where in Nebraska: Abundant regular spring and fall migrant statewide, locally common regular breeder in the northern and western portions of the state. Rare casual summer and winter visitor. 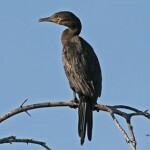 In migration can be found on medium to large lakes and reservoirs in addition to rivers like the Platte and Missouri. Sandhills lakes host breeding colonies especially lakes with large dead trees. 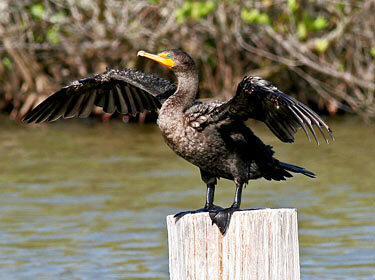 Fun Facts: Double-crested Cormorants nests sometimes have pebbles in them and the parents treat them like eggs.